Since I just finished Winter in Fairbrook, now I'm playing Nicole. I'm also in the middle of re-playing Duel Love and Onedari Sharemate. I can't think of an occassion where I was only playing one otome at a time. I'm playing Fate/ now and go through UBW true end... Huuh--- this make me ignore my otome game lists But after I've done with this, I'll probably play GHP Platinum Yukito route. Just recently (yesterday) started Backstage Pass... Loving it just for the fact that it has one of my most favourite type of guy!! haha..actually currently played Jurassic Hearts also but..haha..stop at the begining due to overshocked..hahahhaXDD..
not really much has play Otome Game in a few months ago.. I've been trying to get through DL More Blood lately, but I still play Fire Emblem: Awakening and Pokémon on the side. Ah, and Animal Crossing, of course. I'm on the middle of downloading Dot Kareshi. Just completed Konno Tamao's album in Tokimeki Memorial: Girl's Side 3 for the PSP. Picking up my demo of ALICE=ALICE, that's what. And also a little bit of The Blind Griffin on the side. Just have to wait for ALICE=ALICE and Bad Medicine to be delivered, it seems. I have the demo for Dandelion, when I have some extra cash I might buy it. I really love it's theme song. Lucky you... I'm too broke to buy any game. I've played both Remember Me and Love and Order, and for the price that they were, they were just... train wrecks. I was disappointed. On the bright side, I can at least find solace in the fact that I bought them during Christmas, so all their games were 50% off. You can imagine I stocked up. I'm just about to start Fate/Knight Rhapsody, I've heard good things about it, so I hope it's one I can get really into. Oh good heavens, SO JEALOUS!!! Saber is one of my all time fav characters so I'd kill to play that game!! Please let us know how it is after you play! 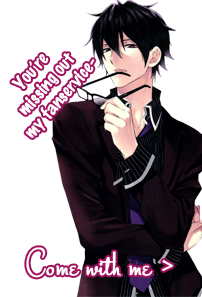 Meanwhile, I am playing Voltage's Scandal in the Spotlight, which I like...but no Saber!!! actually there more game I currently play but I lazy to type more hehe ...moreover most of the game was delayed because my computer not in the good condition !My head is hurt to see how many game not has been finished! I'm playing StormLoverKai but sometimes I also play(replay scenes/cg ) Hakuouki demons of the fleeting blossom. I'm so envios of people who can play Alice in heartland games .. Amnesia: Memories. I already finished Shin & Ikki's route. I'll be starting Kent's route today.